Not "vaporware"; here are shots of Mike's latest test pieces. He's got a little more tweaking to do. ^ Those frets look outstanding. Mike's list on the previous page, being very extensive, doesn't look like it's represented on just these two frets you posted. That's a good thing I guess because it means more pieces. Question: a good deal of these PE details are sort of generic IJN are they not? I have the Nichimo Shiranui (Kagerō-class) waiting in the wings somewhere which is why I ask. This is a good segue into the continued availability and popularity of these 1/200 destroyer kits. Trolling ebay, they are sometimes seen offered for sale in various guises--some have older boxes with really nice 'at sea' artwork on the tops. Others look more recent with monochromatic/solid color boxes with only the description, specs and logo (I think these contain real brass pedestals for the display stand). I don't know the actual status of Nichimo Ltd but the latter style look as if they are fairly recent production. I hope so because I am a fan. *I believe the Nichimo Kagerō class were not motorized so I seem to recall that they lack the detriments to their appearance by way of the provision for battery access. Its hull seems rather plain in the pictures. No "eyebrows" over portholes, no hull plating lines and a degaussing cable that looks like a simple smooth line. Of course it can also be that those details are extremely subtle and thus not noticeable in the pictures. We talked about this a bit in the Main Forum's Upcoming Releases thread, and it seems this is a re-release of the Monochrome/Trumpeter kit from the late 2000s. A pretty good kit, by all accounts. Oh, sorry for repeating the topic then. Good to know that this is a kit worth buying. Are there any PE sets available for it other than Big Blue Boy's one? The Monochrome kit degaussing cable does have attachment brackets. I'll check for other details when I get home next week. The Blueboy pe is the only ones I know of. Project number F51. The Fuyutsuki subclass were originally going to be built to the same specifications as the Akizuki class but construction was more simplified. Four vessels were built under the Maru Kyū Programme (Ship # 361-364). 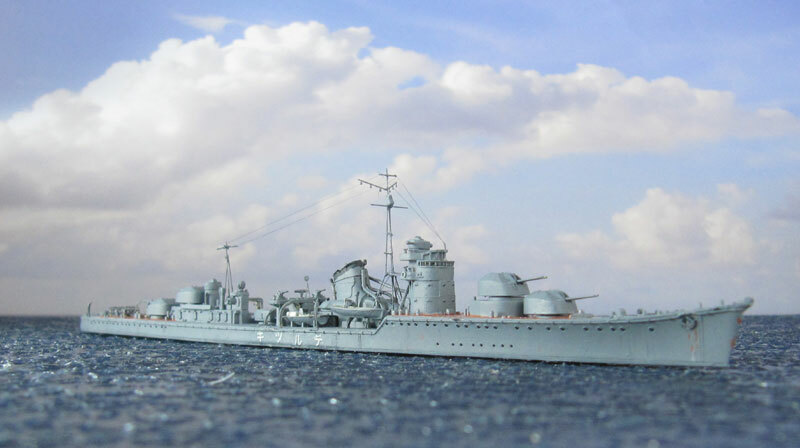 Main differences from the Akizuki class were simplified bow design, removed rear deck house, and fitted two-dimensional air inlet for boilers. However, the IJN was not satisfied with the design. More modifications were ordered, leading to the Michitsuki subclass. Paul Allen's R/V Petrel also found the sunken Wakatsuki among the wrecks at Ormoc Bay last December. I have been remiss about posting some pics. To my knowledge, of the six Akizuki-class ships lost in the war, only Wakatsuki and Shimotsuki have been located. That's a very nice, clean build, Maxim. It is interesting that Teruzuki was not found - she is one of the many Guadalcanal wrecks, of which a considerable number was found. Anybody can shed some light on the aft deck linoleum/steel plating arrangement for suzutsuki? Is the arrangement shown in the Gakken book and the same photo posted by Dan on Page 4 of this post the actual arrangement the ship went into battle with or was the lack of the linoleum in the region between the fouth turrent and the 1st depth charge rack a result of linoleum ripping off post war? There's no way of knowing for sure, as I do not know of any photos of her deck in that time period (or at all for that matter, excepting the postwar photos). Personally, I would think they would seek to keep the deck covered with linoleum while operational. That's the frustrating I am facing, the lack of wartime photo in the aft deck region of suzutsuki. I can't remember the exact sources, but I have read somewhere that later in the war IJN ships were starting to remove the linoleums because they found it was a serious fire hazard and enemy to the damage control team. So I wonder if the rear of suzutsuki is the product of this stripping exercise during the war. I guess without wartime photos this will remain a mystery and the modellers' are left to their preferences to decide displaying suzutsuki's backside with or without linoleum. Be advised, the linoleum was stripped out of the interior spaces, not the exposed decks. Does Fujimi have a full hull NOT DX version of their 1/700 Akizuki? I like the twin pack idea but it seems only the waterline one comes in standard version. I would ideally want one full hull and the other waterline, not willing to pay for the DX version just for one lower hull. Thanks for the clarifications Dan. I thought the stripping exercise was happening for the exterior areas as well.